I know you might think I'm clever, but really, I'm not. Full credit goes to Lauryn Cohen, aka Bella Baker, who came up with this cute concept. Lauren is the queen of sweet and is known for her uniquely creative treats and crafts. 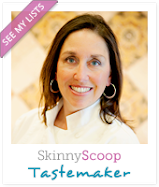 She recently launched a holiday baking guide (entitled Sweet Gifts Holiday Baking and Crafting Guide- available nationwide) filled with innovative and delicious recipes for the holidays. Lauryn was nice enough to share one of her creations with The Family Chef. In this recipe, she calls for a red velvet cupcake (you will find a gluten-free, no-dye recipe in my upcoming cookbook). You can always use a basic vanilla (regular or gluten-free). Here is her technique for making super cute holiday cupcakes for your friends or family. With an offset spatula, frost a thin layer of buttercream icing onto the top of each cupcake. If you have a strip of some fun paper, wrap it around the cupcake. Cut the pointy tops off of the ice cream cones (I might try it with kitchen scissors). In a microwave-safe bowl, melt the red candy melts in the microwave in 30-second intervals, stirring vigorously with a spoon between intervals, until they are completely melted. They should take 2 or 3 intervals to melt completely. 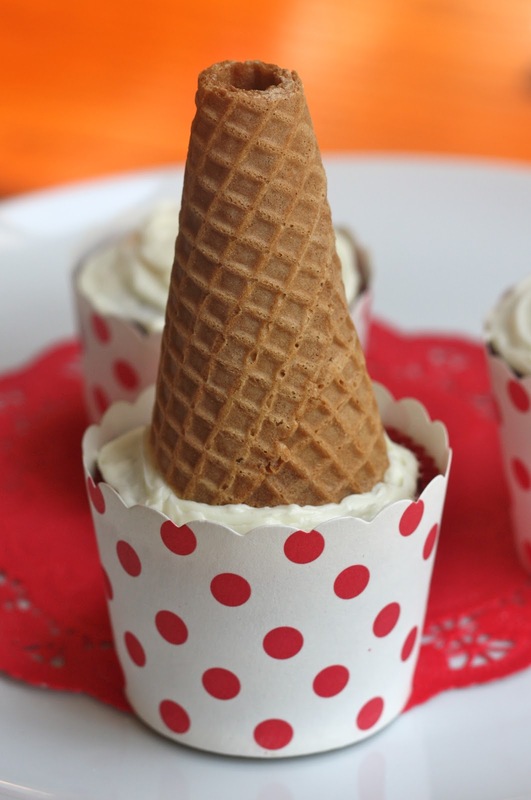 To decorate each cupcake, place your index and middle ﬁnger inside the large opening of the ice cream cone for stability and then carefully, using a spoon, coat the entire outside of the ice cream cone with the melted red candy melts. Immediately coat the entire cone in red sanding sugar. Gently slide your ﬁngers out of the cone and stand the cone on a sheet of parchment paper (or a silicone baking mat). Dab a small amount of the melted candy onto a gumball and place it on the top of the ice cream cone. Allow to dry completely. 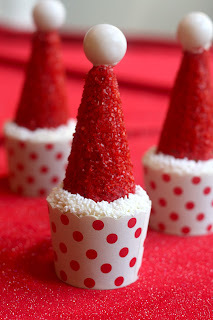 Place the Santa Hat onto the cupcake. Finally, sprinkle the white dot sprinkles or white sanding sugar over the icing that is peeking out around the edge of the ice cream cone.